Daryl Johnson (Worcester Park, United Kingdom) on 18 September 2011 in Documentary & Street. 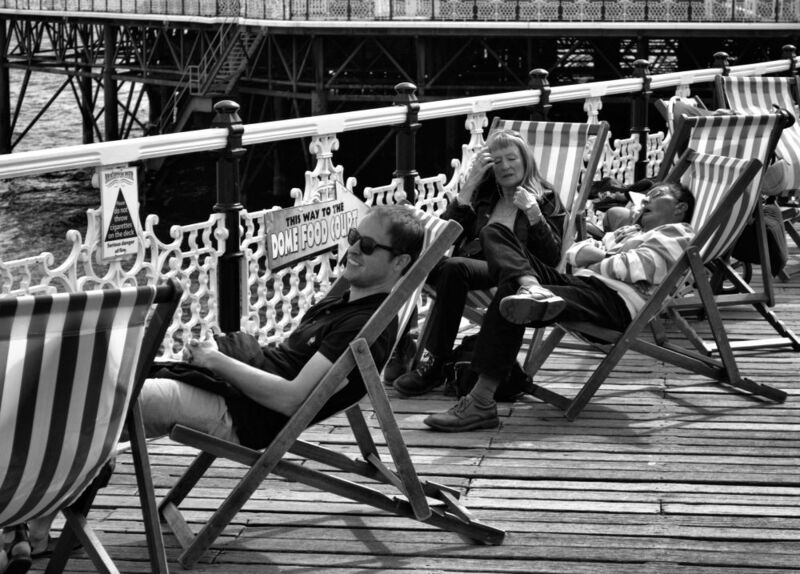 What a surprise to see Prince William relaxing in a deckchair on Brighton Pier. It's that kind of town, I guess. I'd rather run into Kate. ;-) A cool shot. I see one minder has the camouflage shirt ! @Ronnie 2¢: The perfect disguise, hey Ronnie? Oh la belle vie !!! A very nice B&W !!! I hope you'll soon get an other connexion!! I love the guy sleeping, and how his shirt matches and contrasts the stripes of the chair. Very nice scene and excellent capture ! I'd rather run into Prince --oh well, the artist formerly known as Prince.